Even though It’s a Small World is not on my list, it is a stunning attraction to see during the holidays. At the Disneyland Resort, the holiday season (which started November 13th, 2015 and ends January 6th, 2016) is the best time to visit the park. Even though this time of the year is the busiest, it is still totally worth it. During the holiday season The Disneyland Resort feels like totally different theme park. Disney spares no expense when it comes to the holiday season and there are special activities taking place throughout The Resort. But that leaves an important question: which ones should you experience? Well, I am here to help. If you are planning on staying at The Resort for more than one day, I suggest trying to partake in all the special holiday celebrations. These shows and events only take place during the holiday season so take advantage of them while you can. However, for those of you that are not staying multiple days, like myself when I visit in December, I have come up with seven holiday activities and events that you need to experience. These events are not in any particular order but they all should to be in your Touring Plan. This picture does not do the firework show justice but trust me, it is great. 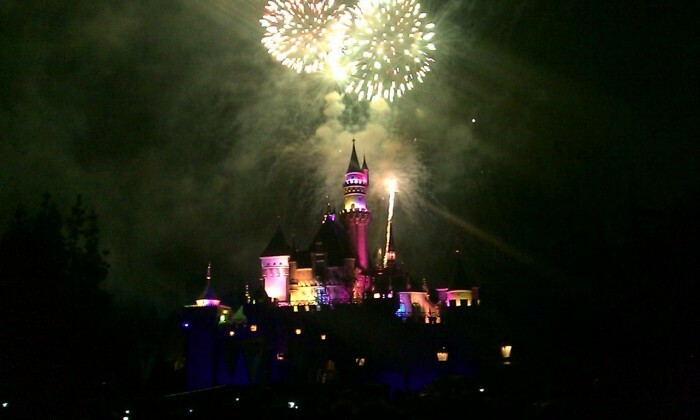 I know that this one is going to be on many guest’s “must do” list and that is because it is an amazing firework show. Even though Disneyland Forever is not the traditional holiday firework show that takes place but it is still a great show to experience. When I first heard about Disney re-theming Jungle Cruise with a holiday makeover a few years ago, I had my doubts, but I was totally wrong. Jingle Cruise is actually now one of my favorite holiday makeover attractions at Disneyland. I love the fact that the Cast Members play an even bigger role in making this attraction feel more like the holidays. Oh, and do not worry, the jokes are still as corny but with a holiday twist. Jack and his friends take over The Haunted Mansion during the holiday season. I still remember being there opening day of The Haunted Mansion Holiday makeover back in 2001 and being amazed on how much detail was put into it. Jump to present time and the details keep on getting better and better. Even if you have been on Haunted Mansion hundreds of times, riding during The Nightmare Before Christmas makeover is a totally new experience. 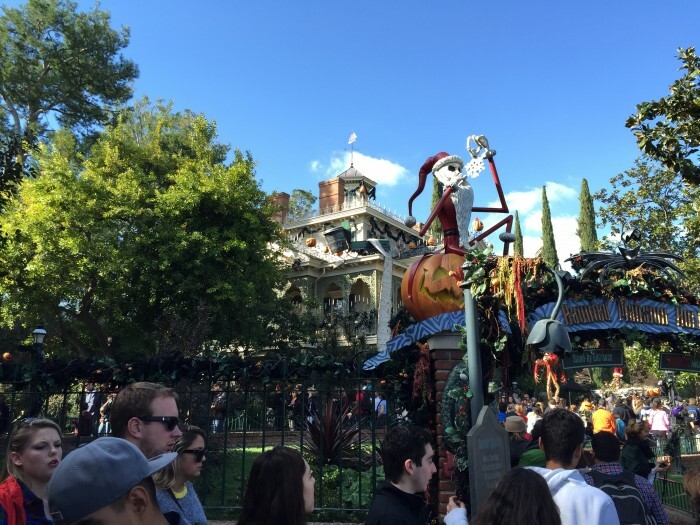 This is the only Disney park around the world that does this holiday makeover to their Haunted Mansion. So, do not miss out. One of the areas of California Adventure that is better at night is Cars Land. This is even more true when the holiday season rolls in. Cars Land gets entirely decked out for the season and it is amazing to see. While you are walking down Route 66, make sure to notice all the detailing that surrounds you. 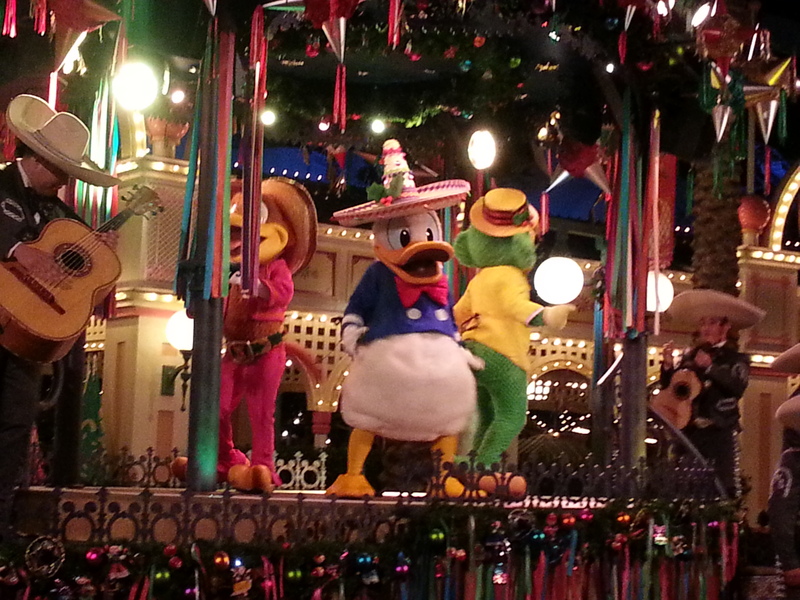 Donald Duck and his friends get down during ¡Viva Navidad! ¡Viva Navidad! is my favorite holiday show at California Adventure. Donald Duck (my favorite Disney character) and his friends the Three Caballeros come to celebrate the holiday season. There is an infectious mix of mariachi, samba musicians, carnival dancers, and a 12-foot-tall mojiganga puppet. It is just one big party that everyone will surely enjoy. I know this is not a holiday event, but it will be the last time you will ever be able to watch Aladdin-A Musical Spectacular again. 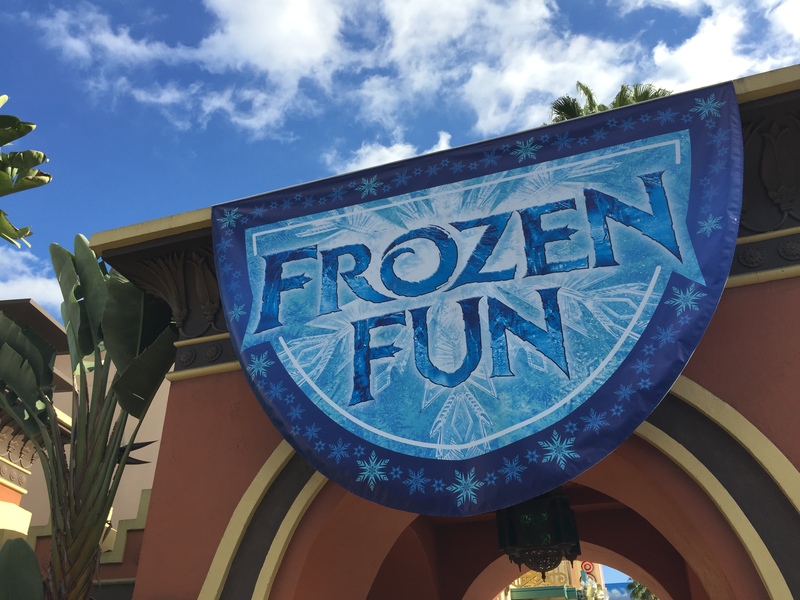 A Frozen live action stage show will be taking it’s place in summer of 2016. So, before it is gone forever, make sure you and your family have to chance to experience a mini-broadway show right inside of California Adventure. No extra charge! It is Frozen, so that means it is fun. Even though I am personally not a fan of Frozen I know there are millions of people out there that are. So, if you are, then make sometime to stop by Olaf’s Snow Fest. This event will be taking place at Stage 17 in Hollywood Land (next to The Monsters Inc. attraction). There will also be musical performances and special snacks that you can only get there. Bonus: If you are looking to take a picture with Santa Claus, you can either head to Critter Country in Disneyland (at Pooh’s Thotful Spot) or at Eilas and Company Department Store inside of Disney California Adventure. Both lines get pretty long but it moves fast so you should not be waiting too long. Whatever or however you tend to spend your holiday vacation at The Disneyland Resort, just make sure you have a great time and do not be surprised by how crowded it will be. Rather, enjoy the time you have with your loved ones at The Happiest Place on Earth. This is truly the most magical time at Disneyland so soak in as much as possible. P.S. If you are looking for some must-do activities at Walt Disney World during the holiday season, then you should check out Dani‘s list of the 5 Must-Do’s at The World. It is a must read for anyone going to Disney World during the holidays. What are some things you enjoy doing during the holidays at the Disneyland Resort? What advice would you give to a person that will be taking their family, or ones self, to The Resort during this holiday season? Edit: It was pointed out that Disneyland’s normal holiday firework show is not showing this year so it has been replaced with Disneyland Forever. Growing up Southern California, it was hard for Ray not want to go to Disneyland everyday. He was a passholder for over 10 years until he left to teach English in Korea and now lives in Seattle. Even though he lives in the Pacific Northwest, he always has Disney on the mind. Ray is channeling his Disney passion to write for TouringPlans. Umm… sorry to be *that* person, but, isn’t Believe in Holiday Magic not happening this year? I thought we were just going to get Disneyland Forever straight through the holidays. Besides that, though, the list is spot on! Only thing I’d even add in is to stop and watch the projections on the iasw facade after dark. Not to be a TOTAL jerk, but this article really doesn’t live up to TouringPlans’ editorial quality level. -The second park is called “Disney” California Adventure, not “Disneyland” California Adventure. -For an article with “8 must-do activities,” only 7 are listed. Unless that includes the “bonus” item, but then it’s not really a bonus item. -It’s worth noting that the Cars Land Christmas decorations are infinitely more impressive after dusk when the lights turn on. -As Ashley already pointed out above, the first item on the list (Believe Holiday) is not being presented this year. -How about World of Color Winter Dreams, which (unlike Aladdin) is actually seasonally-specific? My apologies if I’m being a jerk. Thanks for your comment! Really appreciate the feedback. BTW: WOC Winter Dreams isn’t enjoyable to me. That’s why it isn’t on the list.